Bodhiseed is the seed of the tree under which Lord Buddha meditated and received enlightenment. It is traditionally the most popular and religious mala for Tibetan Buddhists. 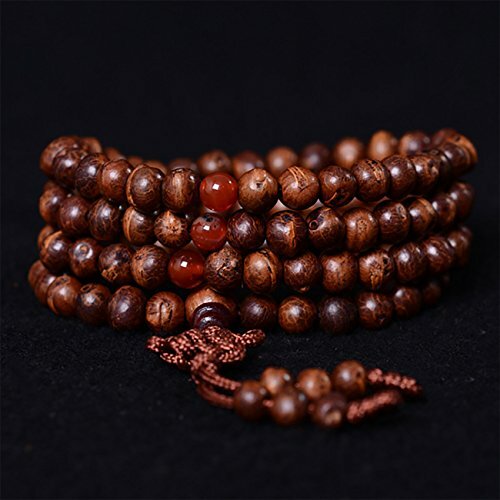 Great Mala for Meditation and Compassion. Length of the mala can be adjusted to wear around your neck or wrist easily. Size of bodhiseed mala beads are approximately 9 mm. Each of our Bodhiseed Mala will have matching Guru Bead and Tassel. Note: All our Wooden and Seed Malas are well strung on Multi strands Nylon thread available with Love and Prayers. The little Bodhi seeds are very rare seeds, it has brown spots and the shape of the wooden fish. It is an alert of live in the monment like a fish. Because, the fish itself is a symbol of freedom and relaxation. The function of this mala is to alert us to treat the sophistication into simpleness. So, when facing the sophisticated moment, take a deep breath and start to count the mala in the preyer of Na Mo A Mi Tou Fo, you will fell the peace immediately. The little Bodhi seed mala itself as a sacred object. 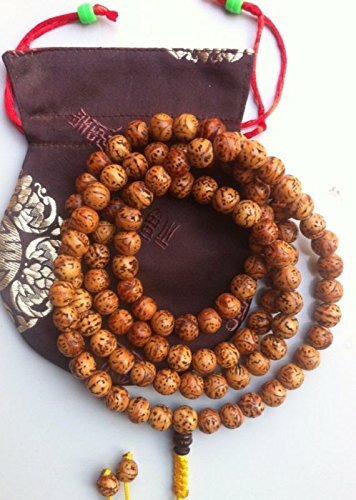 It can ward off evil, a refuge by wisdom, and to bring people peace, good luck, wealth and health, more and more people began to like to wear Little Bodhi seeds. Counting the beads frequently will elevate self-cultivation and self nourishing. My trip to Nepal this time i found these bodhi seed beads. The bodhi seed beads on this mala came from Bodh Gaya India where The Lord Buddha Shakyamuni attained enlightenment. For your meditation i think it would be a special mala. These are smallest bodhi seed beads you can find these days. There are 18 bodhi seed beads on this wrist mala and each bead measures 10mm. 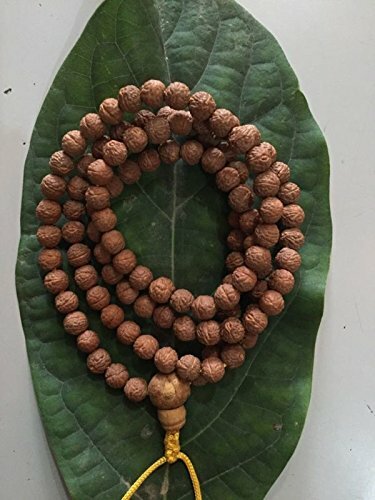 This bodhi seed mala comes with a handmade cloth bag but the color of the bags might vary. 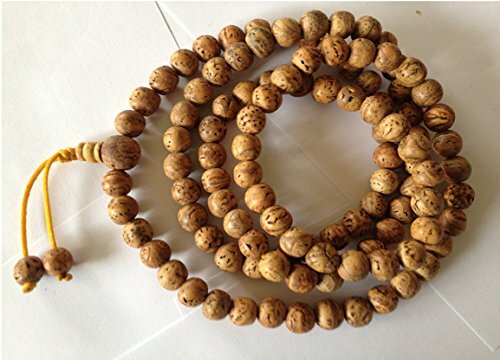 Malas are used all over by the Buddhists around the world especially they are used in Tibet, Nepal and India. You will always see the monks as well as lay people using them while walking around the stupas or temples or monasteries. A Mala is usually used for prostrations, counting mantras, and so on. It is worn on left wrist while not in use. Suggested Mantras for this mala "Om Muni Muni Maha Muni ye soha" To Lord Buddha Shakyamuni "Om Tare Turi Tutari Turi Soha" To White Tara "Tayatha Om Pekatse Pekatse Maha Pekatse Raza Samu Gati Soha" To medicine Buddha. This listing is for an original Bodhi seed mala with 108 beads. There are 108 genuine bodhi seed beads on the string and each bead measures 11mm approximately and guru bead measures 13mm. This mala comes with a handmade cloth bag with draw string closure. The color of the mala bag varies. I will try my best to pick your choise of color. You can put a short message in the message box, when you pay. These beads hand picked and strung in Kathmandu Nepal. Prayer Beads mala are usually used for meditation, counting mantras and prostration and etc. Malas are worn on left wrist while not in use. Please let me know if you have any questions. My trip to Nepal this time i found these bodhi seed malas. The bodhi seed beads on this mala came from Bodh Gaya India where The Lord Buddha Shakyamuni attained enlightenment. For your meditation i think it would be a special mala. These are smallest bodhi seed beads you can find these days. There are 108 bodhi seed beads on the string and each bead measures 10mm and the circumference of the mala is around 42 inches long. 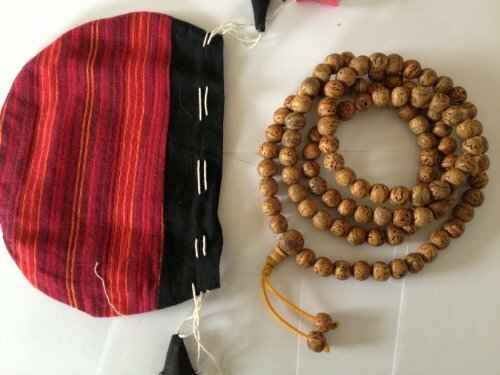 This bodhi seed mala comes with a handmade cloth bag but the color of the bags might vary. 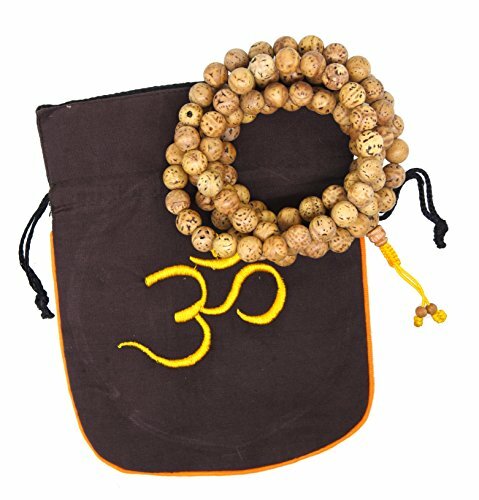 Malas are used all over by the Buddhists around the world especially they are used in Tibet, Nepal and India. You will always see the monks as well as lay people using them while walking around the stupas or temples or monasteries. A Mala is usually used for prostrations, counting mantras, and so on. It is worn on left wrist while not in use. Suggested Mantras for this mala "Om Muni Muni Maha Muni ye soha" To Lord Buddha Shakyamuni "Om Tare Turi Tutari Turi Soha" To White Tara "Tayatha Om Pekatse Pekatse Maha Pekatse Raza Samu Gati Soha" To medicine Buddha. This is a great quality handmade bracelet. Great for yoga meditation and praying. 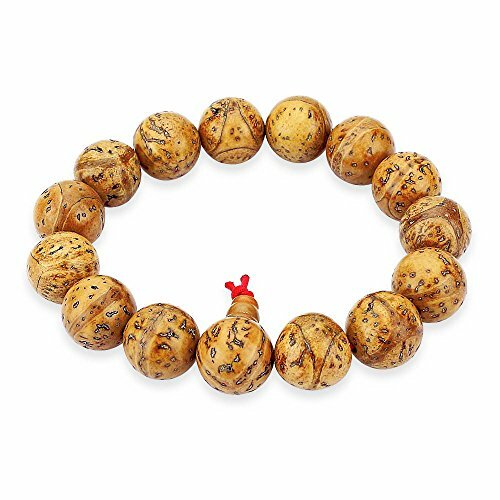 This is small natural raktu bodhi seed mala from Nepal with amazing phoenix eyes. Raktu Bodhi seed beads can be used for counting all types of mantras, as well as other prayers. Raktu Bodhi seeds have sacred meaning throughout Buddhism. Each mala comes in a gift-presentation case made of brocade called mala bag or mala pouches. Bodhi seed beads can be used for counting all types of mantras, as well as other prayers. Bodhi seeds have sacred meaning throughout Buddhism. Each mala comes in a gift-presentation case made of brocade called mala bag or mala pouches. 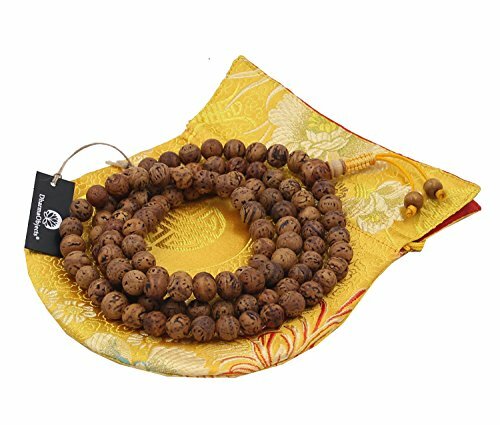 Large Long 108 8mm Rudraksha Bodhi Seeds Meditate Prayer Beads Mala Necklace 32"
Shopping Results for "Bodhi Seed Mala"